Product innovation at STEM For Kids continues with the newest launch that brings the fun of Minecraft gaming together with Java computer programming for a mind stimulating experience. 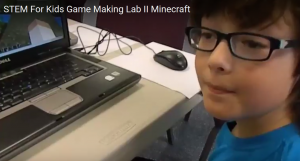 After countless hours of research, listening for children and teacher feedback, curriculum development and testing, STEM For Kids’ Curriculum Team and STEM Coaches were thrilled to launch The Computer Game Making Lab II program this summer in Raleigh. The team’s goal was to make STEM + Minecraft = Engaged Students. The adequate balance of building, budgeting, role playing, civil engineering, team working, creating, communicating, critical thinking and Java computer programming with the fun of Minecraft® was sure to engage all participants as they smiled, laughed and had fun while learning new STEM skills. With the broadest array of engineering, computer programming and advanced manufacturing programs for children in preK-8, STEM For Kids is making Science, Technology, Engineering and Math fun and real around the world. “Minecraft” is a trademark of Mojang Synergies AB. National and international franchise opportunities are available for single and multi-units. Entrepreneurs with a passion to impact their community through education can learn more and apply at the STEM For Kids website, www.stemforkids.net/franchise or call +1 866 991 7053.